I’m so excited to be writing this out. And as a first blog post too! Around January, Lindsey Taylor, a friend of mine and the Marketing Manager for Arvest Bank in my hometown, asked to meet up to talk about a photo project. They wanted to create a new line of debit cards that featured some of the beauty of downtown to invoke small town pride, and Lindsey wanted me to help them! Months of planning, waiting for the perfect sunsets, and lots of editing went into the shoots (as I took an HDR approach to the work so that as much detail as possible could be displayed). Once Arvest and I solidified the shots we wanted, then we waited until the trees were green to take the final shots! The whole time, I had to keep my mouth shut about the project, and I’m pretty sure me having to keep my mouth shut made me feel like James Bond (so if you saw a photographer running sneakily around taking pictures of downtown Siloam several times a week, that might have been me). 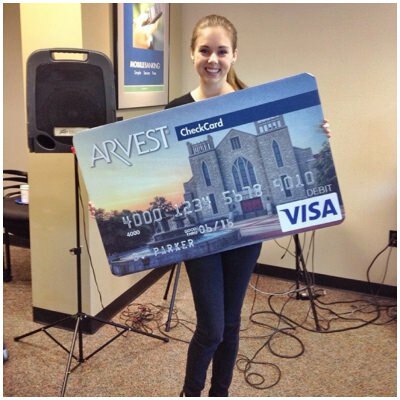 Finally, at our community’s First Friday Coffee (a get-together for local businesses to catchup and network and have coffee), which took place yesterday because of Easter, Arvest announced the new cards and introduced me as the photographer for them! They even had one of the designs printed on a huge styrofoam “card” to show what they would look like. How cool is that?? If you’re a local to my area, you can buy the John Brown University card today if you have an account with them, or get the card for free when you open an account with them! The other designs will be on their way and ready before you know it!